Atlanta, GA–According to a 2011 survey from the American Society for Aesthetic Plastic Surgery, cosmetic eyelid surgery, also known as blepharoplasty, was among the top five surgical procedures performed in the United States. Because there is an extensive amount of surgical and nonsurgical options available, weighing out the pros and cons of each procedure is essential to achieve the best results. 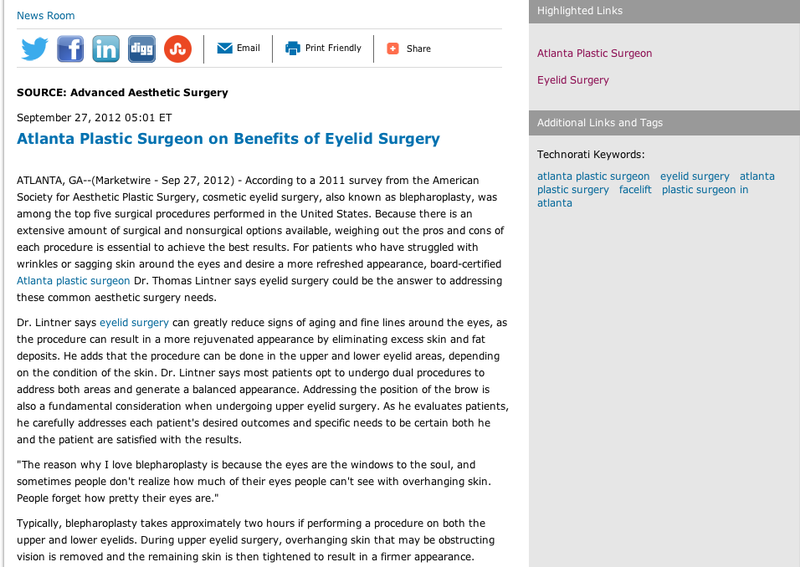 For patients who have struggled with wrinkles or sagging skin around the eyes and desire a more refreshed appearance, board-certified Atlanta plastic surgeon Dr. Thomas Lintner says eyelid surgery could be the answer to addressing these common aesthetic surgery needs. Dr. Lintner says eyelid surgery can greatly reduce signs of aging and fine lines around the eyes, as the procedure can result in a more rejuvenated appearance by eliminating excess skin and fat deposits. He adds that the procedure can be done in the upper and lower eyelid areas, depending on the condition of the skin. Dr. Lintner says most patients opt to undergo dual procedures to address both areas and generate a balanced appearance. Addressing the position of the brow is also a fundamental consideration when undergoing upper eyelid surgery. As he evaluates patients, he carefully addresses each patient’s desired outcomes and specific needs to be certain both he and the patient are satisfied with the results. Typically, blepharoplasty takes approximately two hours if performing a procedure on both the upper and lower eyelids. During upper eyelid surgery, overhanging skin that may be obstructing vision is removed and the remaining skin is then tightened to result in a firmer appearance. Incisions are made in the creases of the upper eyelids, which can minimize the appearance of scarring. Lower eyelid surgery involves the removal of excess, drooping skin below the eyes through an incision made under the lower eyelashes, resulting in a more lively, youthful appearance. For both procedures, Dr. Lintner says his ultimate goal at his Atlanta plastic surgery practice is to eliminate skin in a way that makes scars less visible and to create a natural, more vibrant appearance for his patients. Dr. Lintner and his experienced team create patient-specific treatment plans to ensure individual aesthetic surgery needs are met. Whether he is performing a facelift or rhinoplasty, Dr. Lintner strives to provide optimal results and educates patients on how to make the most out of their cosmetic surgery procedure. Dr. Lintner gives his patients detailed, comprehensive advice on the best procedure to suit their needs, and urges anyone considering a cosmetic procedure to consult with a board-certified surgeon. Strong doctor-patient relationships have helped Dr. Lintner and his staff facilitate an environment built on core values such as health, education and honesty, which he believes is further informed and strengthened by the experience and expertise gained during the invaluable certification process. Dr. Thomas Lintner received his medical degree from Emory University School of Medicine and graduated with honors from Georgetown University. He has given multiple presentations covering specialties such as general and plastic surgery, and he has been published in national journals of medicine and surgery. Dr. Lintner is a member of a number of professional organizations such as the American Society of Plastic Surgeons, American Society for Aesthetic Plastic Surgery, Georgia Society of Plastic Surgeons and the Medical Association of Georgia. Advanced Aesthetic Surgery has two locations, both reachable at (770) 771-5151: 711 Canton Road Suite 400 in Marietta, GA, and 120 N. Medical Parkway Suite 200 in Woodstock, GA. The practice can also be contacted online via the websites tomlintnermd.com, atlantamommymakeover.com, or facebook.com/tomlintnermd.